Welcome to the new website dedicated specifically to the Northern Illinois football season.On this site you will find information about season, group and single game tickets at Huskie Stadium, along with information about the highly anticipated games! Dave Doeren, a 16-year collegiate coaching veteran whose teams played in eight bowl games and two national championship contests, was introduced as the 21st head football coach in Northern Illinois University history. Doeren came to NIU after five seasons at the University of Wisconsin where he was the defensive coordinator and linebackers coach from 2008-10 after spending his first two seasons in Madison as the Badgers co-defensive coordinator, linebackers coach and recruiting coordinator. 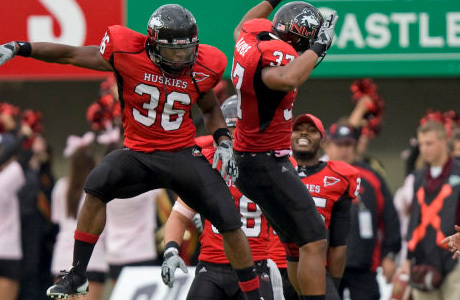 Five days later, the 2010 NIU football team defeated Fresno State in dominating fashion in the Humanitarian Bowl. The Huskies beat the Bulldogs, 40-17, behind quarterback Chandler Harnish who passed for a season-best 300 yards on 17-of-27 passing and ran for 72 yards on 10 carries. Harnish rushed for two touchdowns and passed for another on his way to game MVP honors as the Huskies won their 11th game of the season.